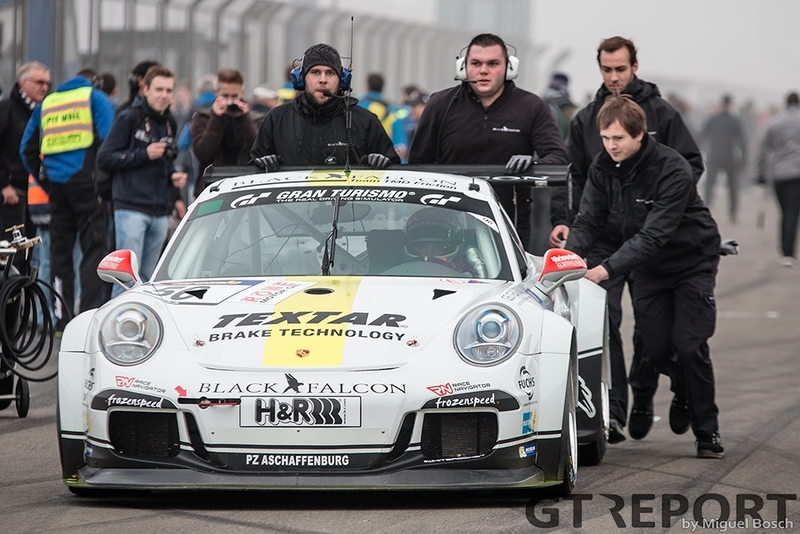 Black Falcon caused an upset last weekend at the VLN season finale at the Nürburgring by beating the faster SP9/GT3 cars with their small Porsche 991 GT3 Cup BF. 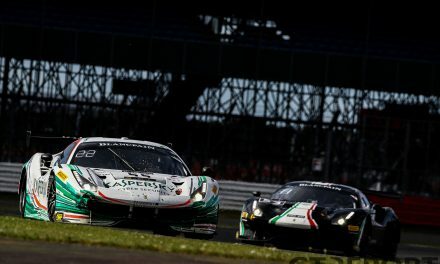 Regular drivers Gerwin Schuring and Manuel Metzger and occasional team mate Philipp Eng saw a season of hard work and success climax with an outright win that was thought impossible. Although the win came unexpected, in hindsight, the writing had been on the wall for some time. 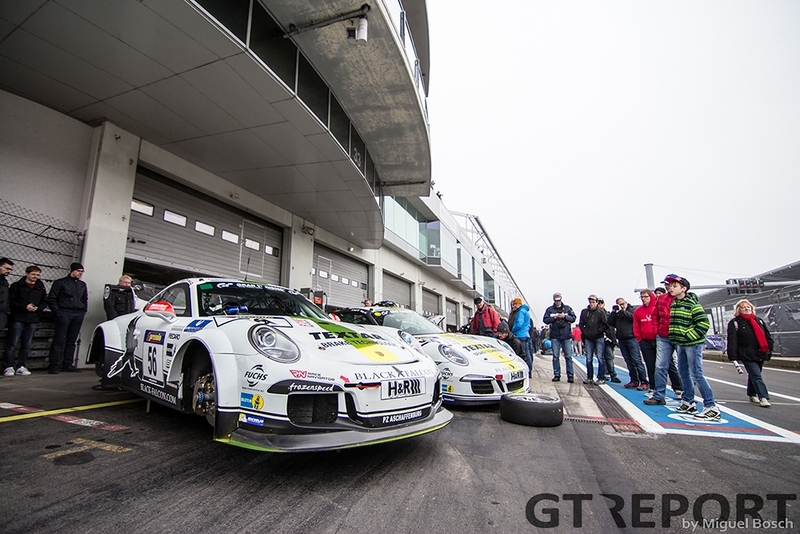 In the run-up to finale the white Porsche had already taken to the outright podium once before and won the 24 hours of the Nürburgring in its class as well as scoring three class victories in VLN. The season had already been such a success that Metzger earned two outings in the team’s Mercedes-Benz SLS AMG GT3, winning in just his second race in the top class. 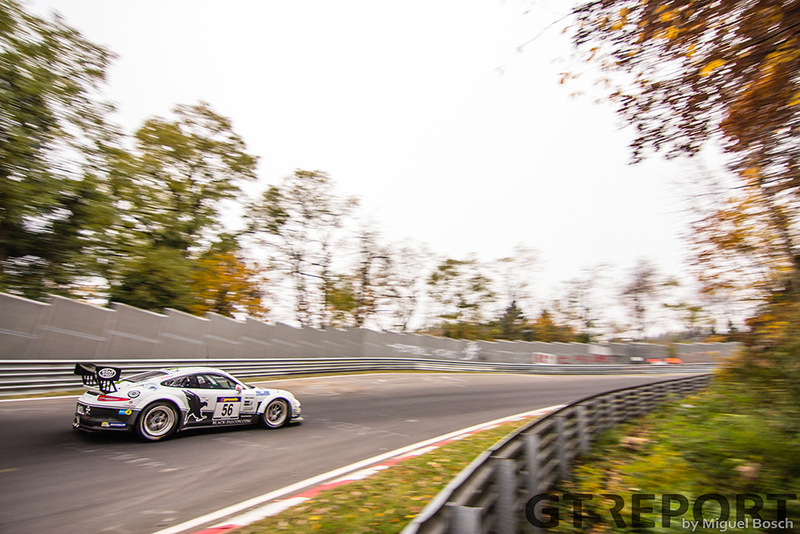 But no success even came close to the shocking win in VLN10. “It’s even more awesome than the last win, with the SLS, because this is an underdog car,” an ecstatic Manuel Metzger says. “I think nobody had us on the radar, until half an hour before the end when we were on top. And then when the red flag came, we were in second place. I didn’t know exactly which lap was counting, and then they told us lap eighteen counts, and we were first. It’s unbelievable, just unbelievable. 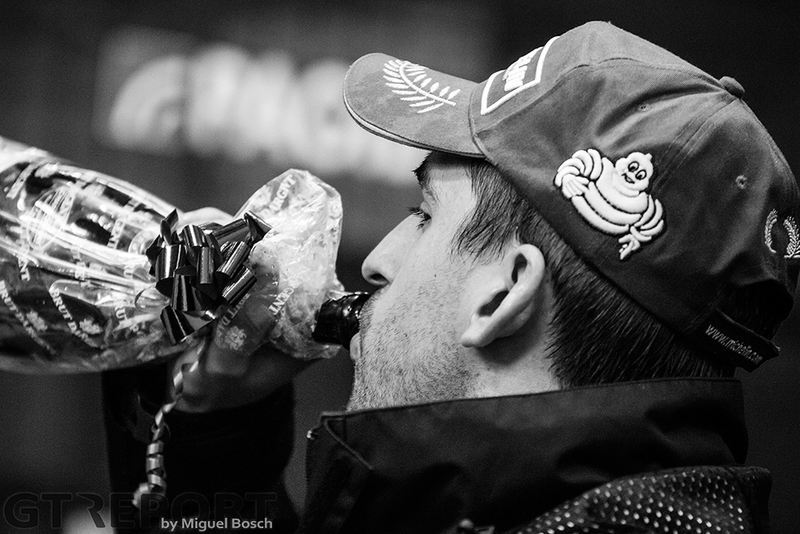 “Philipp [Eng] and me were quite quick the whole race. We did consistent lap times in the low twenties. The pace was really high today. We could keep up with the pace of the GT3 cars. I had the [Twin Busch Audi R8 LMS ultra GT3] in front of me, and I was matching his lap times. He was either one or two seconds per lap quicker, but not more. “It is perfect,” Metzger continues. “You don’t need any adjustments, nothing. You step in it and it’s perfect. While Metzger has been the revelation of the season, it’s gentleman driver Schuring who went through the steepest learning curve in 2015. The Dutchman made his debut only two years ago so couldn’t rely on the same kind of experience his team mates had. “Well, for someone who drove his first race two years ago, it’s an unbelievable relief,” a still buzzing Schuring says an hour after driving into victory lane. “Of course we had a bit of luck, but we’ve had such a fantastic season together that it’s awesome to finish it together like this. “We’ve had our ups and downs, had so much fun together. I’ve learned so much from both Manuel and Philipp. Every race we sit down behind the computer and look at the data, and they explain me all sorts of things. “They got quicker and luckily so did I. So I’m still ten to twelve seconds behind them. But they got quicker with that car by twenty seconds, and so did I. That’s really superb. Today Schuring and Metzger were joined by Philipp Eng. The young Austrian had a breakthrough year in 2015, with the victory in the Eifel bringing the season to a perfect end. “I would say that this is one of the coolest victories I’ve ever had,” the Salzburger reflects. “It’s an amazing car. Black Falcon gave us an incredible Porsche. “I don’t know what to say. The whole race was really crazy. We had a really good pace, all three of us. Manuel and me were every lap in the 8:21’s, 8:20’s, so it just shows how amazing the car is. Gerwin did a very good job, he was very quick. “I think everybody thinks it’s well deserved. We were a bit lucky with the red flag, but I guess that’s racing. Sometimes you’re the tree, sometimes you’re the dog. Today we were the dog. “I’m extremely happy for the whole team and especially for Gerwin, because I was coaching him in 2013, in his first ever outing in a race car, and since then we’ve always kept in touch. This year we found a solution to be racing together. Asked if this win was better than the class win in the 24 hours of the Nürburgring, Eng pauses to think about it. Metzger echo’s Eng’s praise for the team, having not even dreamed about winning outright at the start of the season. Now, he’s won twice. “No, [I didn’t expect this] at all. 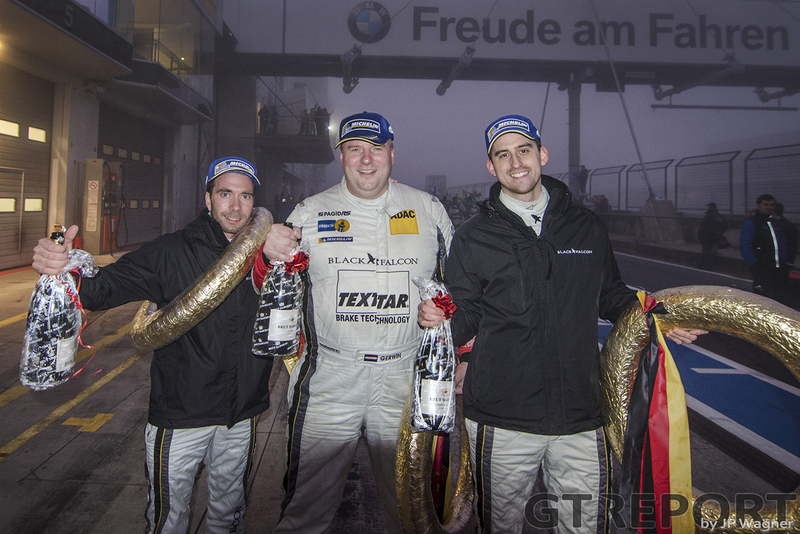 We finished P2 in VLN3, that was incredible, we were stoked. But to win a race is unbelievable, really, really crazy. 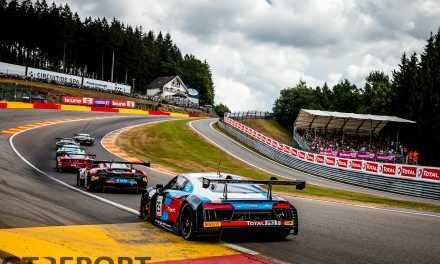 “We came out of the production cars and I wanted to make a step up, in both speed and competition,” Schuring explains his decision to move from the V4 class to SP7. “In SP7 the car [to have] is the Porsche. “When we rolled the car out at VLN1, we were a bit shocked: suddenly there was a competitor, Manthey, and they had a completely modified car with a wider body and everything on it, and works drivers, and we though, ‘hmm, this season will be a bit different than we thought’. “So halfway through the season we also started to modify the car. We made it faster, wider, more aero. So now we have a diffusor at the back and a bigger splitter in front. 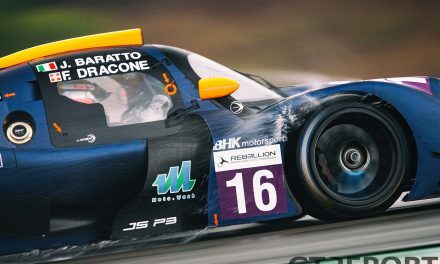 Aside from all the success, there also were three moments where the car was crashed so badly it was damaged beyond immediate repair, costing its drivers good points in the VLN championship fight. Two of those accidents happened with Gerwin behind the wheel, pushing the car and himself to the limit. “Those accidents that I had were both in qualifying, both on a push lap. We often approach it from the bottom up, and sometimes it’s just a little bit too much. Looking forward to next year, there’s first the 24 hours of Dubai. The traditional season opener for the Black Falcon team will see Metzger and Schuring return to the desert race track where they came oh-so-close to winning last time. 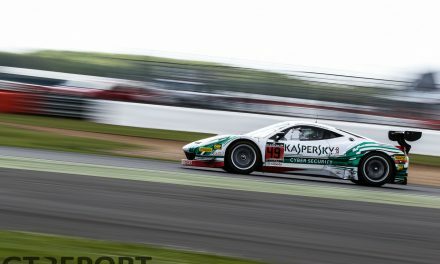 “In January we are in Dubai again, with Black Falcon and two Cup cars,” Metzger says, “and we hope to be as good as last year. We finished second, just twelve seconds behind the leader, so we want to improve on that, to be on P1. Eng’s plans are a bit different. Having now established himself as an international champion, his dream is getting within reach. 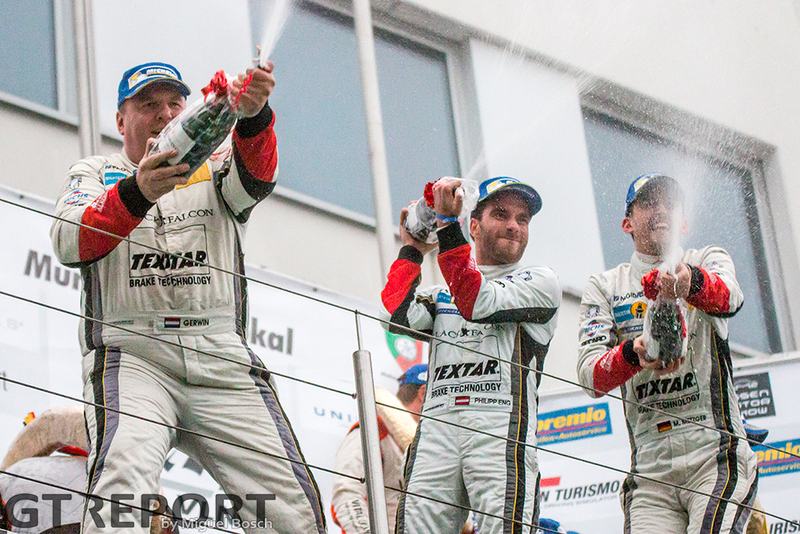 “It’s been a tremendous season,” the double champion in Porsche Carrera Cup Deutschland and Porsche Supercup says. “I was always in very, very good teams. I was in the best team in the Porsche Cups, with Project 1. They always provided me not only with a very good race car, but the best possible environment where I could develop myself as a racing driver as well. Not only physically wise, but also mentally. “And also with Black Falcon, all year we had an amazing car. Every time we were on track we were on top of it. I’m really grateful for all these opportunities, and I hope that some more opportunities will arise for next year.